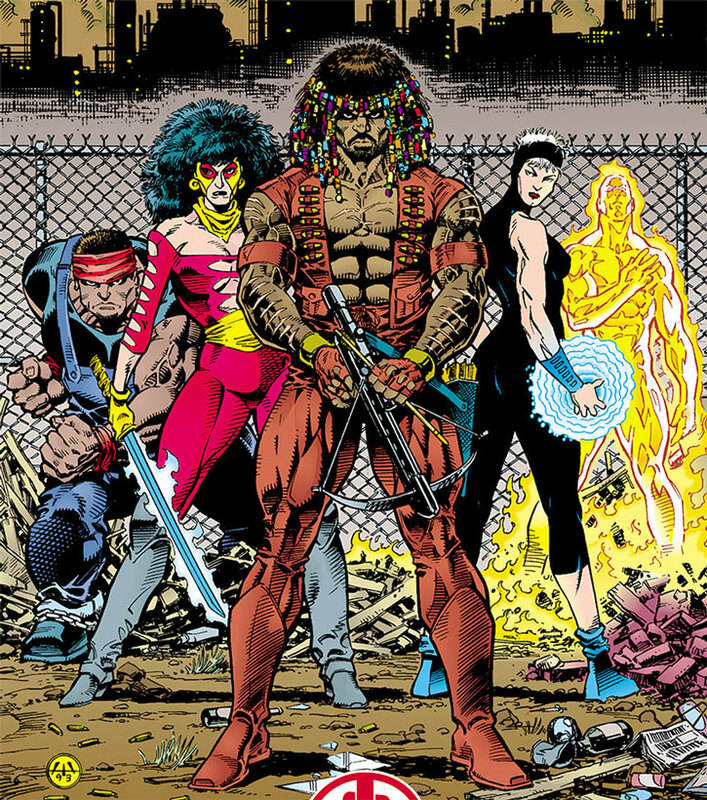 During the 1990s, publisher Dark Horse Comics launched a super-hero universe called Dark Horse Heroes. The city of Steel Harbor is one of the 4 fictional areas where most of the action took place. It was the home of characters such as Barb Wire, the Machine or Motorhead. For further material about Steel Harbor, see the Barb Wire entry. The History section includes minor bits of guesswork as to the pre-1993 situation, based on captions in the comics. There’s some weirdness in the chronology of the 1994 gang war, though I’m not sure whether it was an editorial mistake or me misunderstanding something. I’ve used the chronology that seemed to make the most sense. This stuff is basically a pre-made, unusual campaign set at a low street level. It could be a quite cool game given sufficient knowledge of how street gangs operate. Despite the efforts of the (grossly underfunded and understaffed) police, the superhuman gangs are pretty much the top dogs in the city. The biggest dog are the Prime Movers, led by the superhumanly strong Mace Blitzkrieg and his cadre of superhuman gang leaders. Their main rivals are the somewhat more benign Wolf Gang, led by Hunter. Though the Wolf Gang does not have the raw power and numbers of the Prime Movers, they share bonds with some of the toughest operators in Steel Harbor – including Barb Wire and at least two of her superhuman former bouncers, the Machine and Motorhead. Generally speaking, the Wolf Gang is also more structured, disciplined and paramilitary-like. A well-regulated militia, if you will. Little is known of the history of the gangs of Steel Harbor (unofficial motto : “Steel Harbor – Where the Living Envy the Dead”) before 1993. 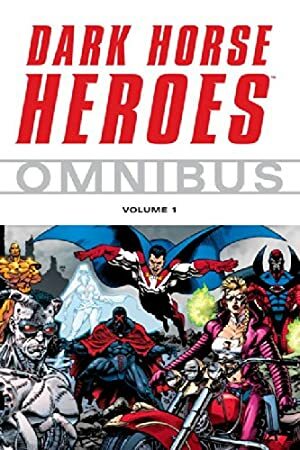 Apparently, the 1980s saw the rise of the super-gangster – superhuman gang leaders using their powers to fight rival gangs and maintain discipline. The City eventually developed a policy of non-involvement, not deploying any police in ’hoods identified as being controlled by a superhuman gang leader. One of the super-gangsters, Hunter, came to occupy a key role. Though certainly not the most overtly powerful superhuman in town, he was good at inter-gang politics, recruitment, creating loyalty and eliminating rivals. His set, the Wolf Gang, became the lynchpin of the equilibrium that existed during the late 1980s and early 1990s. Hunter eliminated the least controllable super-gangters and ensured that no gang would become too powerful to break the existing, fragile equilibrium. Though the Wolf Gang (“Dub-Gee”) grew to include several super-gangsters working as Hunter’s lieutenants (Bomber, Breaker, Burner, and Cutter – presumably they changed their street handles to mark allegiance toward Hunter), Hunter insisted on a relatively benign gang policy so the Wolf Gang would not be seen as such a threat as to create a coalition against it. Hunter was regularly advised by a mysterious woman named Gossamer Vale, whose full roles and affiliations remain unknown to this day. As usual the summer of 1993 was marked by riots. That year, these were triggered and aggravated by news that Golden City was seceding from the United States of America. There would likely have been summer riots in any case, but these news made them exceptionally destructive. Most importantly, they were immediately followed by a major gang war. The real cause behind the 1993 gang war was unrelated to the riots. 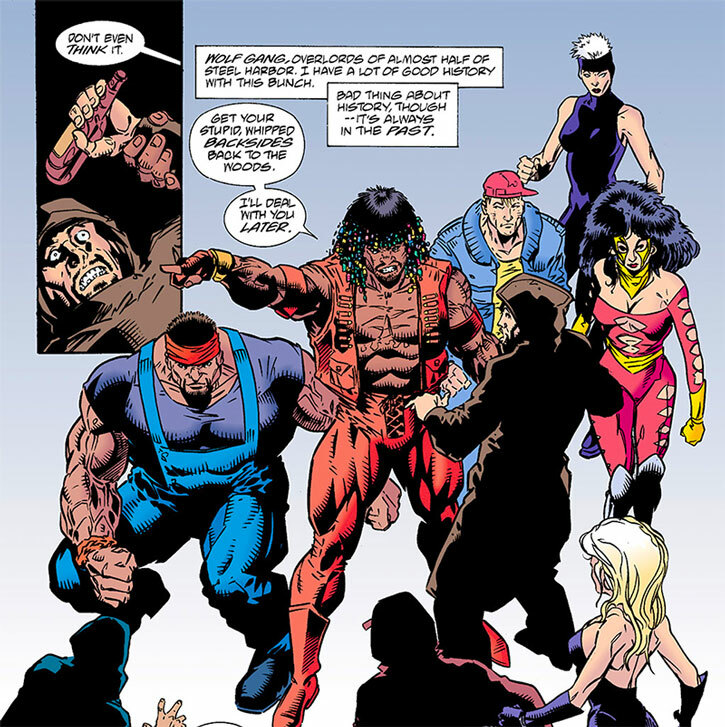 A local superhuman criminal named Mace Blitzkrieg (likely an alias) had been working for a while to unite a disparate collection of superhuman-led street gangs into a coherent force he called the Prime Movers. These efforts were likely backed by an unknown party, since Blitzkrieg had access to significant funding, shady lawyers, and the means to maintain secrecy as he worked. 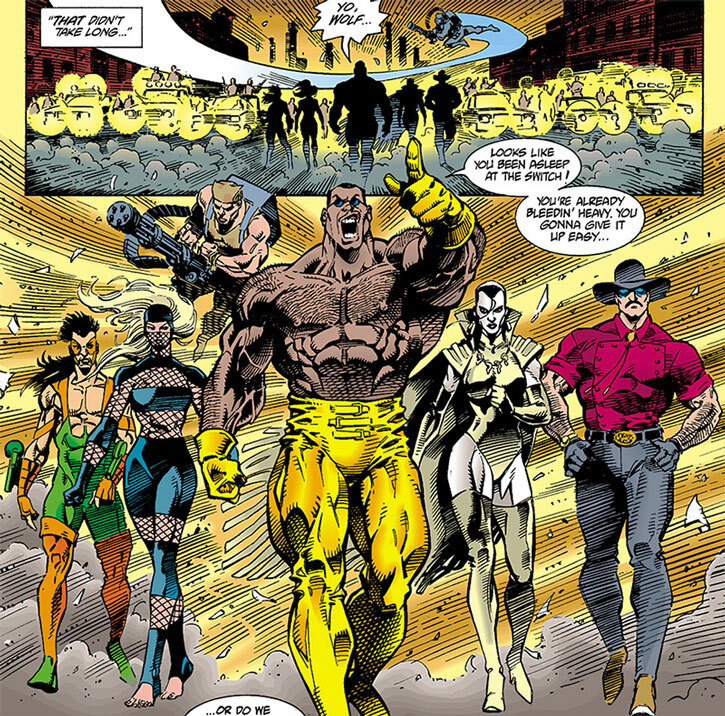 The gangs that secretly became part of the Prime Movers included the gangs led by Airborne, Blackbelt, Deadlight, Hurricane Max, Ignition, and Killerwatt. Apparently, this amounted to every street army (major street gang) in the Harbor that wasn’t wearing Wolf Gang colours. The lawyer serving as Blitzkrieg’s consigliere is a mysterious woman answering the unlikely name of Mesmerization Eclipse. She represents the unknown interests behind the Prime Movers, though much like with Gossamer Vale her full role and loyalties remain unknown. It has been suggested that Eclipse and Vale were serving the same secret masters. Blitzkrieg sent his most expendable gang, commanded by Ignition, to worsen the riots and cause a lot of damage. This kept the fire dept., police and media busy for 3 days as Blitzkrieg moved his forces in position. There was a problem, however – the undisciplined Ignition had recently jumped bail and was taken down by a bounty hunter nicknamed Barb Wire. Ignition repeatedly disobeyed directives in order to feud with Barb Wire, which led to the discovery of Blitzkrieg’s activities.1emsp;Wire also realised that Blitzkrieg was about to launch a massive attack against Wolf Gang turf. Despite Barb Wire’s attempts to warn her ally Hunter, the Prime Movers onslaught took place almost as intended, and Wolf soldiers were overwhelmed. However, the presence of Barb Wire meant that the Machine was also present — and, even more decisively, that Motorhead (Frank Fletcher) flew in when he realised that his bounty-hunting, bar-owning employer was in trouble. While the Wolf forces were on their last leg, Motorhead easily dispersed the Movers. Coming on the heel of fierce riots and widespread arson from Ignition and his gang, the gang war had destroyed large swathes of the Hunter Woods and Mill Heights neighbourhoods. This in turn resulted in blocks, or even sets of blocks (including much of Mill Heights) turning somewhat feral and becoming the American equivalent of a favela, further damaging the rest of the town by worsening crime rates. 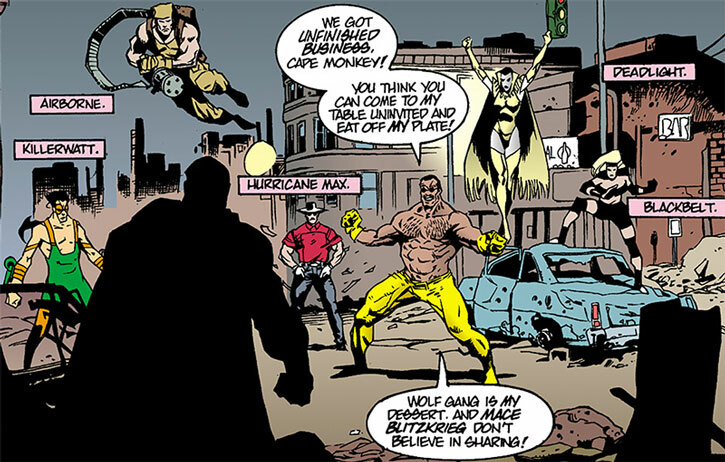 In response, the wealthy residents of the Castle Point neighbourhood contracted a company, Counterstrike Security, to provide them with a superhuman protector. The company hired Emmit Sayers and gave him the “Counterstrike” code name and costume. They didn’t advertise that he had been part of the Wolf Gang until a few years ago. On the other hand, the crushing defeat dealt to Mace Blitzkrieg and the Prime Movers by Motorhead sapped Blitzkrieg’s hold over the Movers. Though he was too strong for his lieutenants to rebel outright, his authority was eroding and the Prime Movers were in danger of losing all of their momentum. Motorhead eventually left Steel Harbor. As soon as Mace Blitzkrieg learned about that, he scrambled the Movers to make another attempt, slapping any reservations about the plan out of his lieutenants. 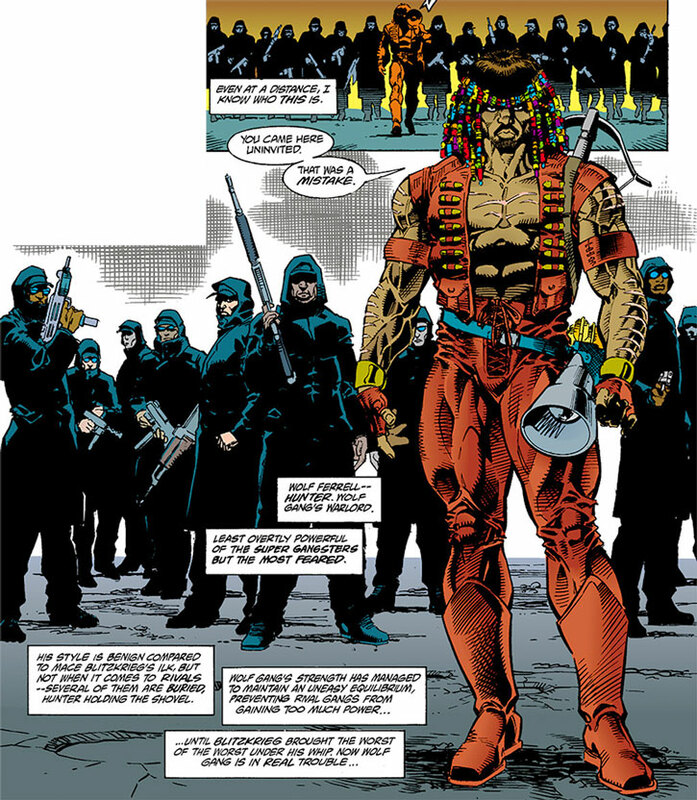 Things were different for the 1994 edition of the gang war, though – perhaps because Blitzkrieg was now confident that he could defeat the Wolf Gang whenever necessary. The onslaught was directly launched at the SHPD, with 3 precinct houses being destroyed in car bombings. The Wolf Gang decided not to intervene, since the Movers were moving away from their turf and toward much wealthier neighbourhoods, such as Castle Point. With Hunter ignoring all requests for help (which was strategically sound but disastrous in term of goodwill), the Movers continued to wreck the police forces facing them and taking uptown turf. When they reached Castle Point, Blitzkrieg and the Prime Movers were slowed down by Counterstrike, and Titan was sent in by the Feds to break the Prime Movers’s onslaught. The Movers were forced to retreat when faced by Titan’s obviously superior might. Motorhead came back early during the crisis. He had just gotten rid of his powers and was looking to resume a normal life in Steel Harbor. Unaware that Fletcher was depowered, Blitzkrieg relied on a solo surprise attack to take him down, and was surprised at how easily he vanquished Motorhead. Barb Wire collapsed a building on Blitzkrieg to save Fletcher’s life, and two Wolf Gang OGs, Bomber and Breaker, broke rank to help her against Blitzkrieg. This eventually forced Hunter to forego his neutrality, and he and the rest of Gang confronted Blitzkrieg. This bought enough time for Fletcher to summon back his Motorhead powers and thrash Blitzkrieg, who narrowly escaped. Demoralised over having to be haunted by his powers again, Motorhead again left Steel Harbor ; as to Mace Blitkrieg, he was forced to lay low. The Prime Movers were out of the game for a while. One of Steel Harbor’s rich and powerful, Faith Perdue, fast-talked the increasingly unstable Titan into attacking the Wolf Gang, telling him that Frank Fletcher was their leader. This re-ignited the situation. Though the Wolf Gang was no match for Titan, Hunter talked Counterstrike into helping them. Surprisingly, Mace Blitzkrieg rallied the Prime Movers OG, as they shared a common anger over out-of-towner Titan imposing a new order upon their city. 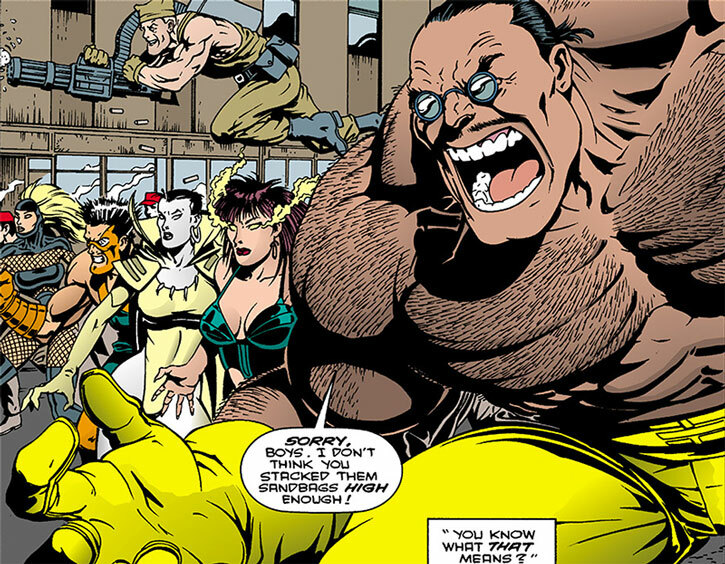 Both the Wolf Gang and the Prime Movers tried to support Counterstrike against Titan, until their foe was called away to deal with a re-returning Motorhead. After Titan left, a temporary truce was agreed upon between Hunter and Blitzkrieg to recover from the ordeal. Some weeks later, one of the Movers’s OG went rogue. Though Ignition had died after having been disciplined by Blitzkrieg, his psychotic girlfriend Maureen Skach became the new Ignition. She briefly allied with minor, old-school superhuman gangster Hardhide, but her unapproved rampage was practically a one-woman affair. She soon clashed with the rest of the OGs in the Primer Movers. The fight was inconclusive and the increasingly unstable Ignition II tried to kill Barb Wire, who ultimately defeated her. Ignition was sent to Golden City to be imprisoned in a specialised jail. Barb Wire also took down Hurricane Max after he skipped bail, and Max returned to prison for a long while. Surprisingly enough, the truce declared in the wake of the Titan attack held for months. Mace Blitzkrieg held the Prime Movers coalition together, but stopped following the ’suggestions’ of Mesmerization Eclipse and concentrated on rebuilding his influence. During the long truce, Barb Wire’s bar, the new Hammerhead Bar and Grille, became the neutral zone and social mingling ground of those wielding influence in town. This included the OGs of the Wolf Gang and the Prime Movers both. There were several near-brawls, but generally the situation held. An unrevealed party decided to bring a match to that powerkeg. Who that was was never revealed, though that may have been the same interests that had been influencing the gangs for years. A female assassin, Deathcard II, was hired to execute on a bloody plan that would convince the two main gangs that the other had declared war, and to set up Barb Wire as a likely culprit when/if the gangs realised that they were being played. Furthermore, Eclipse, no longer able to influence Blitzkrieg, arranged things so that the Prime Movers would think that Mace was behind Deathcard. She implied that Blitzkrieg had a plan to weaken them to take full control of the coalition. She also told them that Deathcard was a disguised Barb Wire. Meanwhile, Gossamer Vale manipulated Hunter to think that Deathcard II was Barb Wire. Whilst the Wolf Gang was hunting Barb Wire, Eclipse had the OGs of the Prime Movers ambush Mace at the Hammerhead. She knew that Barb Wire (and the Wolf Gang chasing her) would get there soon. The two gangs ran into each other during the fighting, triggering a huge battle. 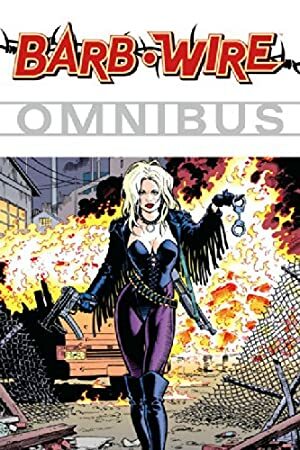 The next part of the plan involved an helicopter gunship piloted by Deathcard to slaughter all the gangsters and Barb Wire as they were fighting. However Wire’s decisive actions derailed that plan and all OGs present survived. Deathcard II was killed by the original Deathcard to prevent her from talking. Another long-lasting truce ensued, using the precedent of the previous one and with the Hammerhead Bar and Grille playing its role as a neutral meeting ground. It lasted for months, though pressure started building up again. 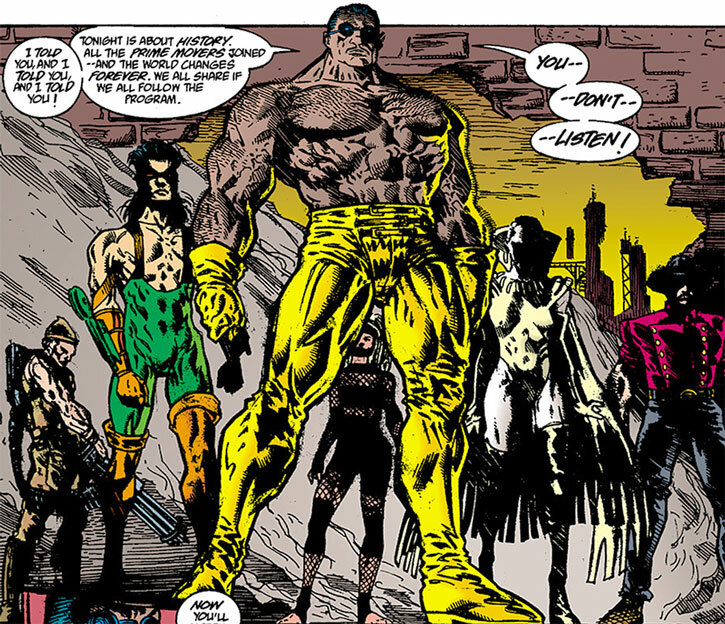 An inept attempt at creating a new super-gang by a vagrant calling himself “Wyvern Stormblüd” started gaining momentum. Furthermore, Barb Wire ended up arresting too many Prime Movers soldiers, building up resentment. Hunter and Mace Blitzkrieg arranged for Barb Wire to take down Stormblüd. Mace and his gang then took him away from her so the two gangs could earn the money in her stead. 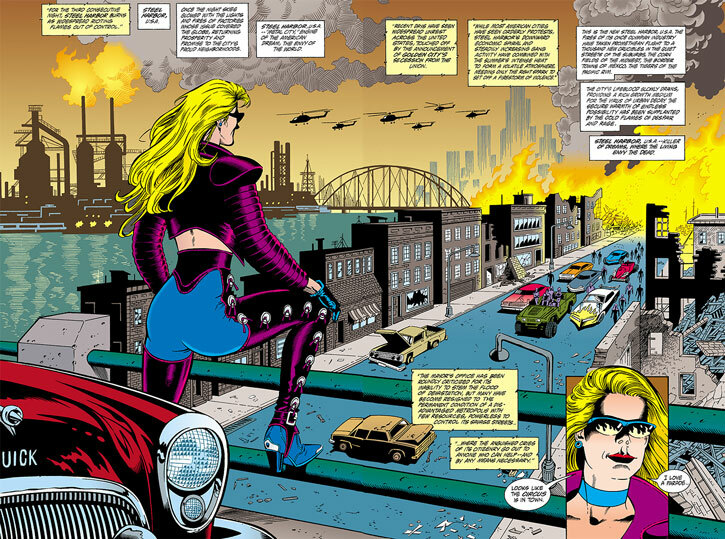 At the same time, both the super-gang leaders were careful to cover for Barb Wire – and Mace used his public dissing of Barb Wire to order this soldiers to drop any vendetta against her. Using Steel Harbor as a whole in the DCU would work. But I’d be careful about that – imaginary cities in the DCU have a track record of getting summarily destroyed so DC can cunningly deprive itself of the wealth of characters and stories that used to be there. 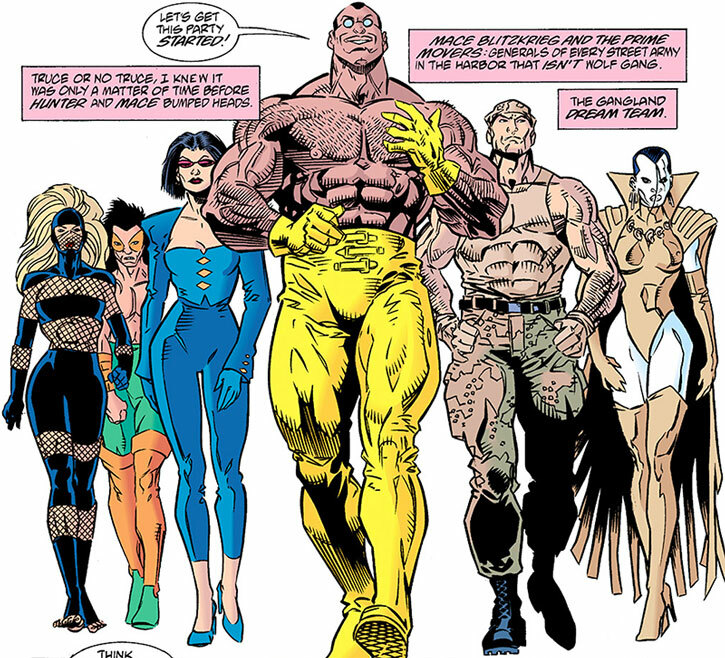 Pre-Chemo Blüdhaven would have been a decent equivalent for Steel Harbor but, well… see above. Area Knowledge (Wolf turf in Steel Harbor), Credentials (Wolf Gang, Low). Submachinegun [BODY 04, Projectile weapons: 05, Ammo: 07, R#03, Advantage : Autofire]. AK-type assault rifle [BODY 04, Projectile weapons: 06, Ammo: 08, R#03, Advantage : Autofire]. The Wolf Gang soldiers all wear the same basic colours – black pants of various types, and a black parka with the hood pulled up over a black baseball cap. Area Knowledge (Mover turf in Steel Harbor), Credentials (their Prime Movers gang, Low). Semi-auto pistol [BODY 03, Projectile weapon: 04, Ammo: 15, R#04]. Machine-pistol [BODY 03, Projectile weapons: 05, Ammo: 06, R#04, Advantage : Autofire]. Hurricane Max’s men dress, speak and live like cowboys. It does look a bit out of place in Steel Harbor, though most go for the “Hispanic Cowboy” sub-style. They often rough it up in the razed areas and abandoned parks, living a bit as if they were on the range. They, of course, like shotguns and pickups. Their turf is Mill Plain. Killerwatt’s gang controls Westbank Landing, and seem to be a pretty typical dockland gang. Airborne’s turf is Saint Ides. His men wear camouflage clothing, cammo bandanas and dog tags. Some were seen driving a 18-wheeler, so they might be involved in smuggling goods. Blackbelt’s turf is South Harbor. Her gangsters seemed more muscular, and may have Martial Artist: 03 on top of the core stats. Deadlight’s turf is Cathedral Park. In 1994, Blitzkrieg had everyone dressed in grey pants and jackets, and red baseball caps, but this attempt at unified colours did not survive the failure of the subsequent onslaught on Steel Harbor. Source of Character: Dark Horse’s Comics’s Greatest World (aka Dark Horse Heroes). Helper(s): Darci, Capita_Senyera, Frank Murdock.